Savvy Housekeeping » How Much Money Does Making Bread Save You? How Much Money Does Making Bread Save You? While I’m still working on organizing my house, my other New Year’s Resolution is to get better at making bread. While I’m certain it’s worth it to bake bread for the sheer deliciousness of it, I’m not sure it’s worth it financially to replace store-bought bread with homemade bread. Let’s investigate, shall we? Here in California, I typically buy about three loaves of bread a month at about $4 each. That’s $12 a month, or $144 a year. In the grand scheme of expenses, that’s not very much money. Ah, but ideally I would be making “artisan” bread, and that easily costs $7 a loaf here. (I know!) So that’s $252 a year. If I made three loafs a month, that’s $3.87 a month, or $46.44 a year. That means, if I made “artisan” bread every week instead of buying it, I would save about $205 a year. That means baking bread would save my about 78%. However, the wild card here is time. Baking bread is time consuming. However, I work at home, which means that I can steal 5-10 minutes throughout the day to knead dough or put it in the oven. Instead of cigarette breaks, I can take bread breaks. Also, I suspect that as I get used to making bread, it will become an easy routine that won’t take a lot of my brain space or effort to do. Also, I could make two loaves at once and freeze one. So. I’m intrigued. I think I’ll try making bread for awhile and see if it becomes a habit that sticks. GET THE WHITE BOULE RECIPE HERE. What about you? 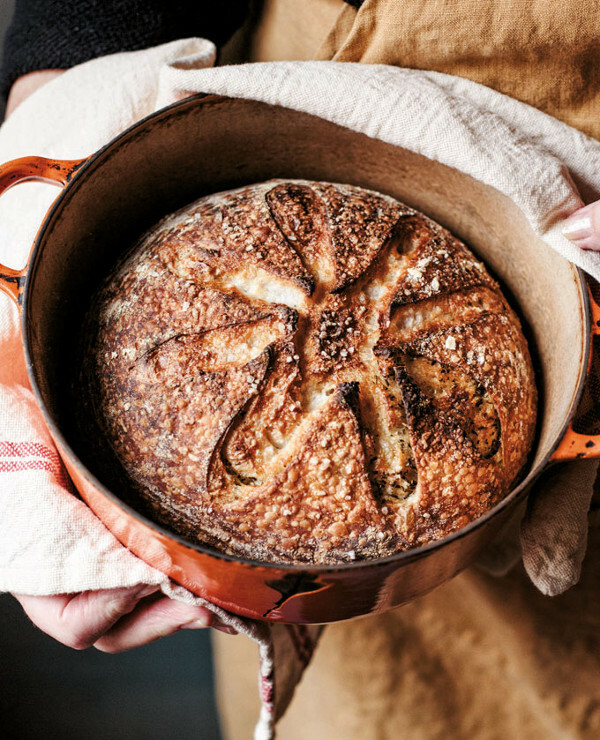 Do you think it’s worth it to make your own bread? And a further time-saver and flavor-enhancer is slow-rising bread, often done overnight in the refrigerator. Make it up, put it in the fridge (go to work if that’s what you do), and take it out to finish in the evening. Or do the rising overnight and bake it the next day. My mother spent years making her own bread. Even if you go with the cheap stuff (plain white or basic brown at $2.49/loaf) you can save money by making basic bread at home in a normal rectangular loaf pan. The trick is to ensure your slices are about the same as store-bought. On Sundays she’d spend her time making 6 loaves which would be frozen and used at leisure (about 1 month) for $0.50 per loaf. As you add ingredients (high fiber flours, seeds, honey etc.) you have to add to the cost, but your store-bought loaf comparison is also more expensive so it all works out. Count how many sandwiches (if you make a lot of sandwiches) you get out of one store-bought loaf and then count the slices you get from your homemade loaf and you get a better understanding of how thin/thick to slice your homemade bread for maximum savings. Thanks for the tips, ladies. This is seeming more doable all the time. I have made nearly all my family’s bread for about two years. I started to save money, but it ended up being more about health. Store-bought bread is so full of preservatives. In order to save time, I use a bread machine on the dough setting to knead and prep the dough through the first rise. Then, I punch it down, put the dough in regular bread pans, and let it rise again. This saves me a lot of time, since I bake bread just about every week. You can also do this in a Kitchen Aid mixer, but I don’t have one. Two loaves a week feeds my family. I freeze one loaf in order to keep it as fresh as possible. Slightly stale bread makes great toast, garlic bread and grilled cheese. I have also learned to make pizza dough and rolls, which makes my family very happy! I make a huge double or triple batch of rolls and freeze them so that I always have bread on hand for dinners. Good luck with your bread making! What about the cost of all the gas used? Or electricity if it is an electric oven? THAT’S what you have to consider when calculating if making homemade bread is less or more expensive.